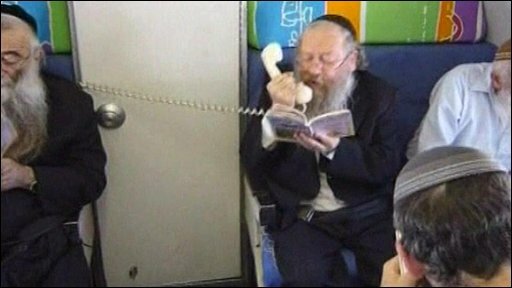 A group of rabbis and Jewish mystics has taken to the skies over Israel, praying and blowing ceremonial horns in a plane to ward off swine flu. The flight's aim was "to stop the pandemic so people will stop dying from it", Rabbi Yitzhak Batzri was quoted as saying in Yedioth Ahronoth newspaper. The flu is often called simply "H1N1" in Israel, as pigs are seen as unclean. Q&A: What is swine flu? Eating pork is banned under Jewish dietary laws. According to Israel's health ministry, there have been more than 2,000 cases of swine flu in the country, with five fatalities so far. "We are certain that, thanks to the prayer, the danger is already behind us," added Mr Batzri was quoted as saying. Television footage showed rabbis in black hats rocking backwards and forwards as they read prayers from Kabbalah, a form of Jewish mysticism which counts the singer Madonna among its devotees. The shofar is the horn of a ram, and is used to mark major religious occasions in Judaism.